i think ur title is wrong because this graph is showing atp rankings and it is not actually released by atp. (08-28-2017, 06:55 PM) someone Wrote: i think ur title is wrong because this graph is showing atp rankings and it is not actually released by atp. 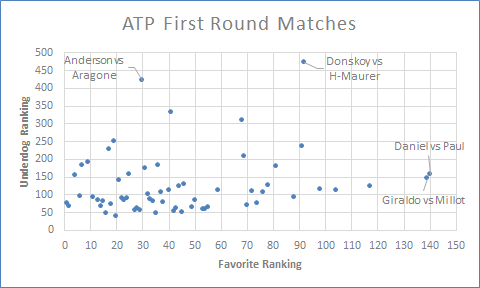 I am not exactly sure but this graph represents the ranking (favoutie ranking and underdog ranking)Â of two players for every first round match. For e.g. the very end dot on right side at the center shows dot for Norrie who is close to 600 rank and Tursunow who is close to 200 rank.